During the warmer months of the year, there are so many ways to stay cool at work and home. Sometimes opening a window or turning on a fan doesn’t regulate the indoor temperature enough and you need an affordable solution to make a bigger cooling impact. In commercial and industrial settings, you may need to offset the heat generated by electronics and protect your assets and property. If you’re looking for something that’s easier to install than an HVAC system and even more flexible than a window unit to cool your indoor space, portable air conditioners offer unparalleled flexibility. Unlike traditional central air conditioning, these smaller units—also called portable spot coolers—are energy efficient, mobile and easy to install and use. Portable air conditioners may sound appealing if you need a cooling option that’s as simple as removing it from the box, venting it and plugging it in. They offer quick and easy comfort and cooling—there’s less time and hassle involved in installation! Portable units also offer a solution for smaller spaces and the attractive feature of being easy to move. Some factors you want to consider when comparing different types of air conditioning units: size of space, the importance of flexibility or portability, efficiency needs, noise concerns and installation requirements. When does a portable air conditioner make the most sense? The top attribute of portable air conditioners is probably the ease of installation. Basically, you get to bypass installation with a portable unit—just plug it in, vent it and start using it. You’re all set! Window units require handyman skills and heavy lifting for installation, while an HVAC system will require professional expertise. You may not have the time, budget or capacity to deal with the disruption of installing an HVAC system. Portable air conditioners emerge as a clear winner in cases where you want to be able to take something out of the box and start cooling ASAP. Just as the name suggests, portable air conditioners can be easily moved around. That’s a benefit if your cooling needs tend to rotate, if you move a lot or need something to cool a space only periodically, and want to store it at other times. Window units are portable, but take more effort to install and pack away. Small portable air conditioners are engineered to cool smaller spaces, such as a single room in a home office or space. They are ideal for spaces around 550 square feet. In larger spaces, they can compromise efficiency, so you may want to consider a window unit if your space is on the larger side but you still want some ease of installation and portability. Window units block the natural light coming through the window in which you mount them, and prevent you from using the window for fresh air or easy egress if needed. If you only have one window in a room, you especially may not want to block it. The venting kits required of portable air conditioners take up significantly less space, allowing natural light to still filter through your windows. Depending on the construction of the building, your windows might not even be able to support a heavy window air conditioning unit, making a portable air conditioner your only non-permanent AC option. Drainage from window units might fall on pedestrians if your window is positioned above a sidewalk or a high traffic area. Window units aren’t the most aesthetically pleasing—you may not want one jutting of your building’s exterior. Window units can also cause damage and injury if they fall, leading some building owners to ban them entirely. If you’re renting a space, you might not even be allowed a window unit for this or another reason. Portable units are also easy to move and store if you change living or office spaces. If you have an HVAC system that struggles to effectively cool an interior, a portable air conditioner offers an option to spot cool a room such as a sleeping area, nursery, office, server room or the like. Depending on your needs, a portable air conditioner can also be cost effective. You can cool strategically—in the room you're using—rather than cooling a whole building or house, racking up utility bills. Saving energy benefits the environment, as well as your wallet. Window and portable air conditioners both generate more noise than central AC. In some cases, portable units can be noisier. Even though the motor from a window unit can be noisy, the noise is typically directed outside of the interior. If you plan to use your AC in a room where you sleep or otherwise need peace and quiet, a portable model might disturb you. That said, most units come with a noise level rating, measured in decibels (dB). Talk to an indoor environmental solutions expert about what you can tolerate in your space. Despite the fact that portable air conditioners are more flexible than window air conditioning units, they still do require you to vent them outdoors. So even though they don’t sit in a window, they will still need to be positioned near a window, door or another vent to the outdoors. Some units may be capable of venting through a ceiling or wall. Certain types of windows, such as casement windows, may not work with portable units. Talk to an indoor environmental specialist if you have any concerns about operating a portable unit in your space. If you need to cool multiple rooms, portable air conditioners may not be the best choice. They are effective for cooling the immediate area, but will not work well for interiors connected by hallways or narrow entryways. When appropriately sized, they work best for cooling an open area. 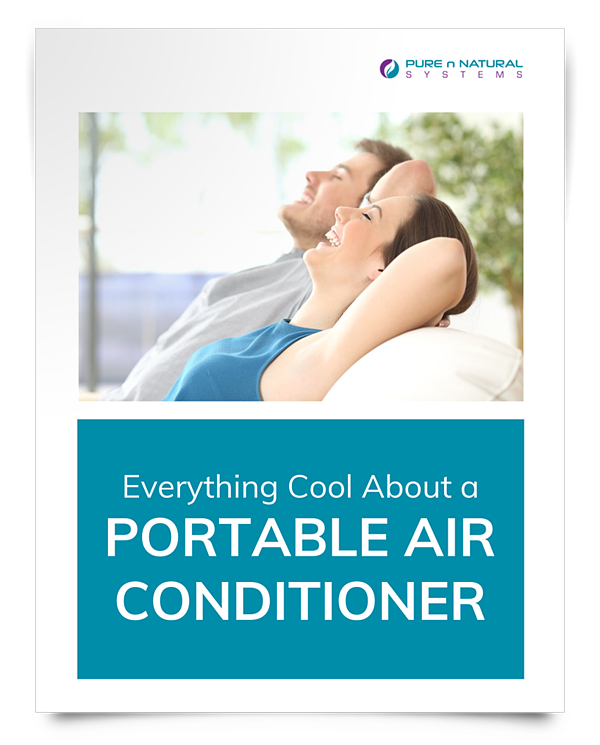 Besides the noise, other potential cons to choosing a portable air conditioner could include the need for something more permanent, covering a larger square footage than what portable units can take. Some portable air conditioning units come with single hoses, others come with two. What’s the difference? Use the same hose for air intake and exhaust. They are less efficient but often cheaper. Consider these for smaller spaces. Use separate hoses for air intake hose and exhaust. They tend to have better energy efficiency, which means they cool more quickly. Consider these for larger spaces. The amount of moisture a unit removes will vary and is likely to be measured in pints per day (PPD). BTU stands for “British thermal unit,” a measurement that indicates the amount of heat needed to increase the temperature of one pound of water by one degree Fahrenheit. Other numbers will include voltage, watts, amps, noise level, air flow, dimensions, weight and cord length. The Soleus KY80 has 8,000 BTUs of cooling power and removes 86 pints of water per day. It cools and dehumidifies spaces up to 350 square feet. The Soleus KY120 has 12,000 BTUs of cooling power and removes 117 pints per day. It cools and dehumidifies spaces up to 550 square feet. SoleusAir is one quality manufacturer of portable air conditioners with a commitment to efficient, easy-to-use and aesthetically pleasing designs. Soleus also designs its units to operate as quietly as possible, if noise is a concern. For larger and commercial needs, MovinCool offers many quality options. MovinCool specializes in portable air conditioners that work in commercial and industrial settings, such as offices, hospitals, manufacturing facilities and more. For example, the MovinCool Office Pro 18 offers 18,000 BTUs of cooling and works great for commercial setting in which electronics generate heat that affects the indoor temperature and comfort level, as well as the operation of the electronics. Some MovinCool products are designed for mounting on the ceiling for applications that might be more permanent. Because they are meant to be moved around, most will come with wheels — or castors — to facilitate mobility. Some portable air conditioning units on the market also double as heaters or dehumidifiers. The MovinCool Classic Plus 26 offers a dehumidification component. Talk to an indoor environmental specialist about your needs. 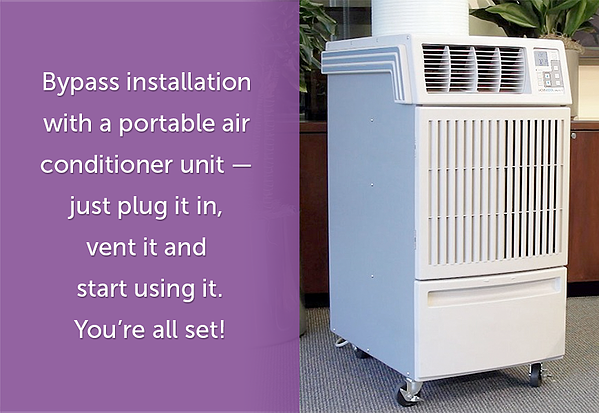 You may be wondering exactly how to properly size a portable room air conditioner before you make a purchase, especially online. 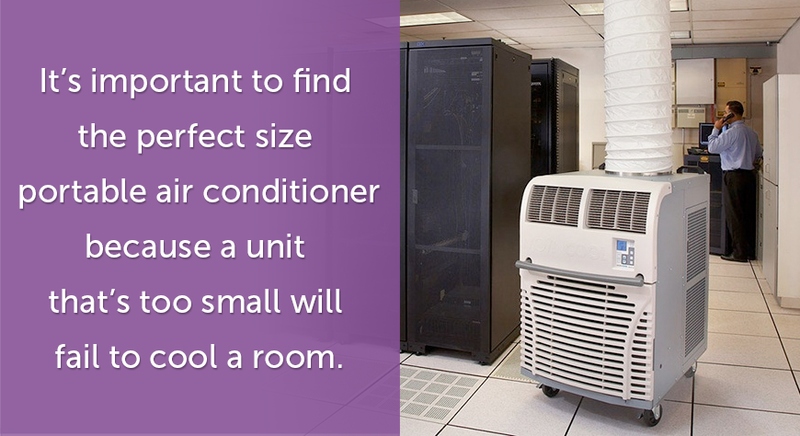 It’s important to find the perfect size because a unit that’s too small will fail to cool a room—but if you buy more air conditioner than you need, it will work inefficiently. Some units may offer coverage for larger areas with even more power. For example, the MovinCool Classic 60 offers 60,000 BTUs of cooling at temperatures of up to 115 degrees Fahrenheit. If your ceilings are higher than standard, you will also want to increase the number of BTUs. If you only need to run your unit during the evenings, you may also be able to get away with less power, but running the unit all day long during peak temperatures may require more. A quality portable air conditioner for home or small-scale use can run between about $310 to $400, so they are certainly a more affordable option than installing an HVAC system. Window units can cost as little as $130 at big box stores but easily run into the same price range or higher. Most people and businesses find this level of portable air conditioners a cost-effective option. If you need a portable air conditioner for use on a larger scale, your costs could run about $3,900 to $13,000. Electrical specs may run a little higher for some models of these larger scale units — up to 460 Volts. Make sure you have the electrical capacity to handle the unit you plan to purchase. In terms of maintenance, your unit may have a filter you need to periodically wash or replace. Follow the manufacturer’s instructions to prevent wear and tear and ensure that your unit operates efficiently. Some portable air conditioning units may collect moisture. They may be designed so that the collected moisture fully evaporates or you might need to install a pump and drain or periodically empty a container that collects the water. An indoor environmental systems specialists can help assess the portable air conditioner needs of your home or business and identify the right model to keep you cool and comfortable.